This special report offers a primer on status offenses—misbehaviors that are only illegal because of a person’s age and that unfairly land many kids in the justice system. These behaviors may stem from a variety of factors that can range from normal adolescent development to underlying problems that need closer attention. But when families, schools, and communities don’t know what else to do, they turn to the justice system. Common scenarios that play nationwide include: school officials calling on law enforcement when kids fight in class; police officers taking runaway kids to detention facilities when there is nowhere else to take them; and parents seeking out courts to get help for children they perceive as out of control. Such a punitive approach has detrimental consequences: it criminalizes kids for misbehaviors that pose little to no risk to public safety and may punish them for developmental changes and service needs that are beyond their control. Francine Sherman and Annie Balck, Gender Injustice: System-Level Juvenile Justice Reforms for Girls (Portland: National Crittenton Foundation, 2015), https://perma.cc/UVR9-RWWY. It also disproportionately pushes kids into the system who are already underserved and more likely to be subject to biases and harsher discipline—specifically girls, kids from poor communities, kids of color, and lesbian, gay, bisexual, transgender, and gender non-conforming (LGBT/GNC) kids. The justice system is not designed to support kids as they grapple with developmental changes or to address the underlying issues that may be causing them to “act out.” Instead, court involvement—and the incarceration that may follow—increases kids’ risk of engaging in future delinquent (criminal) behaviors and moving deeper into the system. Uberto Gatti, Amelie Petitclerc, Richard E. Tremblay, and Frank Vitaro, “Effects of Juvenile Court Exposure on Crime in Young Adulthood,” The Journal of Child Psychology and Psychiatry 54, no. 3 (2013), 291-297, https://perma.cc/XMQ5-UVZA; and Edward P. Mulvey, Highlights From Pathways to Desistance: A Longitudinal Study of Serious Adolescent Offenders (Washington, DC: U.S. Department of Justice, Office of Juvenile Justice and Delinquency Prevention, March 2011), https://perma.cc/WM59-QC4U. As policymakers and practitioners across the country look to reduce mass incarceration, status offenses demand attention as early and improper points of entry into the juvenile justice system, and potentially the criminal justice system more broadly. This special report offers a primer on status offenses, including what they are and why the current approach to handling these cases is not working. It also highlights the key factors that have contributed to the cycle of kids being pushed into the system and what can be done to shift away from this punitive approach. The term status offense implies that a kid has committed a crime, just by virtue of the word “offense.” Yet, they are anything but criminal. Kids—especially teenagers— are known to act up or disobey adults, and engaging in status offense behaviors is not uncommon. For many kids, misbehaving can be part of normal development. Adolescence is a time of complex social, emotional, cognitive, and physical development. American Psychological Association (APA), Developing: A Reference for Professionals (Washington, DC: APA, 2002), https://perma.cc/SX89-78PG. In figuring out who they are and how they want to behave in life, kids often engage in so-called teenage rebellion: exploratory, risk-taking behaviors that help teens assess social, personal, and familial boundaries. Institute of Medicine and National Research Council Committee on the Science of Adolescence, The Science of Adolescent Risk-Taking: Workshop Report (Washington, DC: The National Academies, 2011), https://www.ncbi.nlm.nih.gov/books/NBK53420/. This period of life is also marked by higher impulsivity and susceptibility to peer pressure, leading many teenagers to engage in acts that can be of concern to adults. TJ Berndt, “Developmental changes in conformity to peers and parents,” Developmental Psychology 15 (1979), 608–616. Delinquency usually peaks in adolescence then tapers off. However, research shows that delinquency and misbehaving tends to peak in mid-to-late adolescence, then rapidly decline and taper off in the twenties. Sharon Casey, “Understanding Youth Offenders: Developmental Criminology,” The Open Criminology Journal 4 (2011) 13–22, https://perma.cc/L3YW-2SHZ. In other words, many kids just need time to grow up and figure things out. Laurence Steinberg, “Adolescent Development and Juvenile Justice,” Annual Review of Clinical Psychology 5 (October 18, 2008), https://perma.cc/X29S-CSFN. These teens may need little to no intervention. Proper support, if any, can look like close mentoring with a caring adult who can help the kid navigate daily challenges or support for the parent who is learning to handle their child’s adolescent behaviors. On the other hand, more severe risk-taking and misbehavior might be symptomatic of underlying issues that need attention. These sometimes-complex problems can be connected to all areas of a kid’s life—including experiences with family, school, community, and other personal factors. For instance, students may be truant because they experience academic anxiety and because they also have to help out at home, perhaps because of a parent’s illness or to care for a younger sibling. Other youth who “act out” may be experiencing serious conflicts at home, unmet mental health or special education needs, the loss of a loved one, abuse, maltreatment, and/or other traumas. Because these problems are sometimes complex, they are difficult to identify and address, despite the good intentions and efforts of families, schools, and communities. 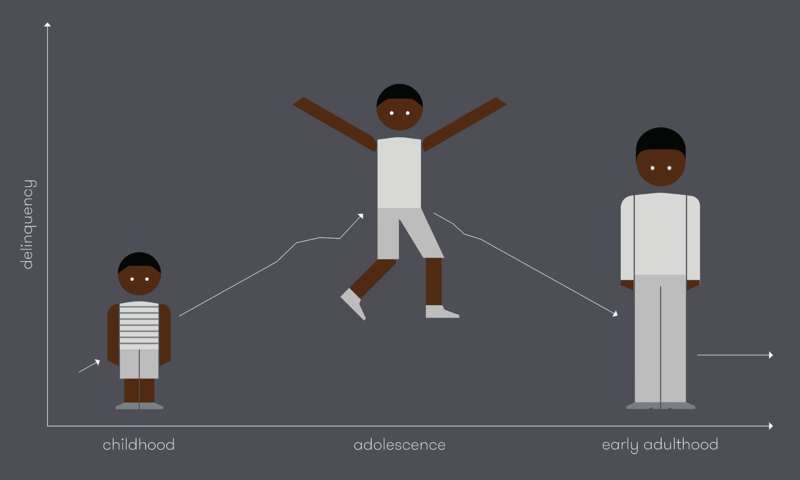 And, when kids’ needs go unmet, they can manifest into behaviors that disrupt their functioning at home and in school. Sometimes misbehaviors are even rational coping strategies—such as when a girl runs away to escape an abusive environment. In fact, running away, truancy, and substance use are the most common warning signs of child abuse, and one in five runaway or throw-away kids report being physically or sexually abused at home in the year prior to leaving or fearing abuse upon their return. Malika Saada Saar, Rebecca Epstein, Lindsay Rosenthal, and Yasmin Vafa, The Sexual Abuse to Prison Pipeline: The Girls’ Story (Washington, DC: Georgetown Law Center on Poverty and Inequality, 2015), https://perma.cc/R26S-HE6P; National Conference of State Legislatures (NCSL), Homeless and Runaway Youth (Washington, DC: NCSL, 2016), https://perma.cc/DS44-VZ37. Rather than punishment, these cases call for more intensive individual and family services that address the kid’s and family’s unique needs. One in five runaway cases is tied to abuse. Kids can be referred to court for status offenses by their schools, law enforcement, social workers, probation officers, or even their own families. But, states govern when and how formal petitions (applications for the court to take formal action on a matter) for such cases can be made, and sometimes the path to court can be quick. For example, Wisconsin defines habitual truancy as missing all or “part of” five days within a semester. Because school districts have discretion to define what “part of a school day” means, a student can be sent to court for as little as being late to class five times. Wisconsin Department of Public Instruction (DPI), Answers to Frequently Asked Compulsory School Attendance Questions (Madison, WI: DPI, 2016), https://perma.cc/6GVV-EXR2. In 2014, there were 100,100 cases nationally in which kids were sent to court for status offenses, accounting for one of every 11 formally processed juvenile court cases that year. Sarah Hockenberry and Charles Puzzenchera, 2014, https://perma.cc/8XV4-G8F9. In reality, however, these figures significantly underestimate juvenile justice system involvement due to misbehavior. To start, there is large variation in the types of courts that handle these cases nationwide. Some courts focus exclusively on status offenses (such as truancy courts), but kids may also be seen in family, delinquency, or even municipal courts (city or county courts that handle low-level adult cases) for these behaviors. In this fragmented system, many courts do not report to a central state or federal repository, making it difficult to tally the total amount of status offense cases nationwide. Texas Appleseed, Criminalization of Truancy in Texas: Prosecution of “Failure to Attend School” in Adult Criminal Courts (Austin: Texas Appleseed), https://perma.cc/8FGS-B2UV. The numbers also do not account for the many cases in which kids who are already justice system-involved are sent back to court for misbehaving while under probation supervision. 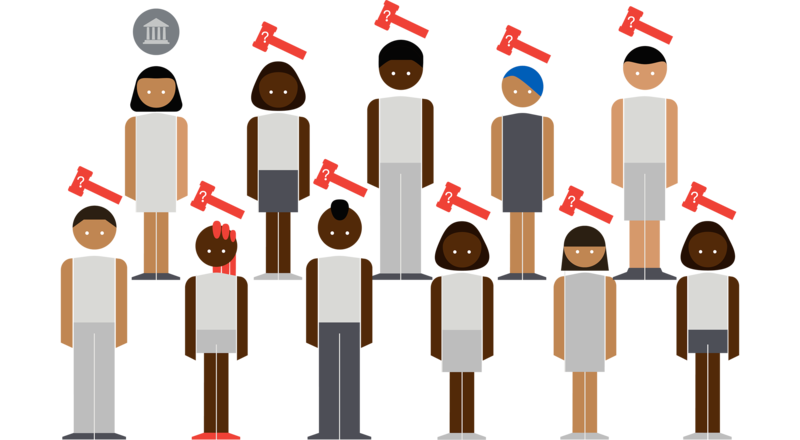 In 2014, status offenses accounted for roughly one of every 11 juvenile court cases. This is likely an underestimate. Contrary to federal guidance, these referrals can result in a range of disruptive consequences for kids and their families, including detention and out-of-home placement. Since 1974, the federal government’s Juvenile Justice and Delinquency Prevention Act (JJDPA) has outlined protections for kids and families in the juvenile and criminal courts. Act4Justice, “What is the JJDPA?”, https://perma.cc/B852-KCR3. Recognizing the harms of confinement and system involvement on kids who misbehave (more in "Why criminalization is not the answer"), the JJDPA mandates that kids charged with status offenses be handled via less restrictive, community-based programs and not be put in locked facilities. Kristin M. Finklea, Juvenile Justice: Legislative History and Current Legislative Issues (Washington, DC: Congressional Research Service, 2012), https://perma.cc/EF2W-FNSN. However, a 1980 amendment added the Valid Court Order (VCO) exception, which provides judges with a potent workaround to this rule: although kids cannot be detained for, say, skipping school, they can be detained for violating a judge’s order to attend school every day. Act4Justice, “Fact Sheet: Deinstitutionalization of Status Offenses Core Protection,” https://perma.cc/A35S-FJ6N. As of 2011 (the last year of available data), 27 states used the VCO exception, and thousands of kids are still removed from their homes to be put in detention and out-of-home placements each year. Coalition for Juvenile Justice, SOS Project, “Fact Sheet: Use of Valid Court Order: State-by-State Comparisons,” https://perma.cc/5YYK-6NNB. For kids who are already on probation supervision, misbehaviors result in “technical violations of probation” rather than status offense charges. Situations like this show why it’s so difficult to determine just how many kids are in the justice system for misbehaving. Kids don’t belong in the justice system for noncriminal acts that stem from developmental changes and service needs—both of which are largely beyond their control. But, the paternalism and interventionism of the status offense system dates back to the turn of the 20th century. The early juvenile courts were built on the doctrine that the state has the responsibility and authority to protect persons legally unable to act on their own behalf. For kids, it was believed that illegal behavior was the result of poor parenting, in which case the state was better suited to care for, control, and rehabilitate them. Howard N. Snyder and Melissa Sickmund, Juvenile Offenders and Victims: 1999 National Report (Pittsburgh: National Center for Juvenile Justice, 1999), https://perma.cc/WDR2-GY7J. Although it is not covered in this report, it is important to note that many parents today are sent to court for their child's misbehavior. For example, recent media attention has been given to parents who receive significant fines and can be eventually jailed for their child's truancy. This alternate punitive response has its own negative consequences for families and, like sending kids to court, does not address the problems that underlie the child's misbehavior. See Jessica Feierman with Naomi Goldstein, Emily Haney-Caron, Jaymes Fairfax Columbo, Debtor's Prison for Kids? The High Cost of Fines and Fees in the Juvenile Justice System. (Philadelphia: Juvenile Law Center, 2016,) 17-19, https://perma.cc/Z2RQ-8BUK. See also: Nadja Popovich, "Do US laws that punish parents for truancy keep their kids in school? ", The Guardian, June 23, 2014, https://perma.cc/7LG8-38E2; and Dana Goldstein, "Inexcusable absences," New Republic, March 6, 2015, https://newrepublic.com/article/121186/truancy-laws-unfairly-attack-poor-children-and-parents. As juvenile courts set out to “fix” youth, their jurisdiction expanded to include noncriminal yet disagreeable behaviors—what are now referred to as status offenses. These beliefs continue to steer today’s status offense systems as adults send kids to court “for their own good”—be it in a conscious effort to get them access to the right services or to correct their behavior using sanctions. As demonstrated below, such criminalizing responses are often subject to unchecked biases and cause harm to kids—all while misusing resources and a system that is intended to keep communities safe. This concept has been noted by other experts in the field, including Francine Sherman and Annie Balck, 2015, https://perma.cc/UVR9-RWWY. Not surprisingly, these varying perspectives lead to disparate consequences for kids, especially girls. Early legal thinking considered boys delinquent if they violated a civil ordinance or law, but girls were charged for general “immorality”—a broad term which included unruliness, associations with immoral persons, vagrancy, frequent attendance at pool halls and saloons, and profanity. Lindsay Rosenthal, “Ending the Unjust Treatment of Girls Charged with Status Offenses,” Think Justice (blog), Vera Institute of Justice, October 26, 2015, https://perma.cc/CT8F-UCLT; and Francine T. Sherman, 13 Pathways to Juvenile Detention Reform: Detention Reform and Girls: Challenges and Solutions (Baltimore: Annie E. Casey Foundation, 2005), https://perma.cc/R7K2-CPHT. That is, girls were punished for behavior that was considered “unladylike”. And, once in court, a higher percentage of girls were sent to reformatories than boys. Joan McCord, Cathy Spatz Widom, and Nancy A. Crowell, eds., “The Juvenile Justice System,” in Juvenile Crime, Juvenile Justice (Washington, DC: National Research Council and Institute of Medicine, Panel on Juvenile Crime: Prevention, Treatment, and Control, 2001) https://nap.edu/read/9747/chapter/7. While these disparate laws no longer exist, girls today are still typically sent to the justice system for less serious offenses (status offenses and technical violations) than boys, and they are more likely to be detained and stay in juvenile justice facilities longer for those minor offenses. Lindsay Rosenthal, 2015, https://perma.cc/CT8F-UCLT; and Francine Sherman, 2005, https://perma.cc/R7K2-CPHT. Unsurprisingly, the same discrepancies exist when looking at poor kids, kids of color, and LGBT/GNC kids. Including girls, these kids are most likely to have limited access to programs that meet their service needs and be subject to biases that lead to harsher reactions to their misbehaviors. For example, schools with more black students are more likely to suspend and expel kids for “acting out,” while schools with fewer black students are more likely to respond with behavioral treatment and special education programs. David M. Ramey, “The Social Structure of Criminalized and Medicalized School Discipline,” Sociology of Education 88, 3, https://perma.cc/TNP5-97SG. Research also indicates that police officers tend to view black kids as less innocent than kids of other races, and teachers tend to view black girls as louder, more unruly, and more in need of reprimand for being “unladylike” than other girls. American Psychological Association (APA), Black Boys Viewed as Older, Less Innocent Than Whites, Research Finds (Washington, DC: APA, 2014), https://perma.cc/9FAF-4MRH; Kimberlé Williams Crenshaw, Black Girls Matter: Pushed Out, Overpoliced and Underprotected (New York: African American Policy Forum and Center for Intersectionality and Social Policy Studies, 2015), https://perma.cc/G7VK-6R4F; and Monique Morris, Pushout: The Criminalization of Black Girls in Schools (New York: The New Press, 2016), 11. And, kids who identify as lesbian, gay, or bisexual are more likely to be stopped by police, arrested, and convicted for engaging in the same behaviors as their straight peers. Angela Irvine, Shannan Wilber, and Aisha Canfield, Lesbian, Gay, Bisexual, Questioning, and/or Gender Nonconforming and Transgender Girls and Boys in the California Juvenile Justice System: A Practice Guide (Oakland: Impact Justice, 2017), https://perma.cc/3L9T-TMSB. For over 50 years, research has consistently shown that community-based programs are most effective in improving kids’ long-term outcomes—including reduced reoffending, educational attainment, improved behavioral health, strengthened family functioning, and greater skill-building. James Austin, Kelly Dedel Johnson, and Ronald Weitzer, Juvenile Justice Bulletin: Alternatives to the Secure Detention and Confinement of Juvenile Offenders (Washington, DC: U.S. Department of Justice, Office of Juvenile Justice and Delinquency Prevention, September 2005), https://perma.cc/ZMV9-5EW6; Christopher T. Lowenkamp and Edward J. Latessa, “Understanding the Risk Principle: How and Why Correctional Interventions Can Harm Low-Risk Offenders,” Topics in Community Corrections (2004), https://perma.cc/37GT-JYXB; and Elizabeth Seigle, Nastassia Walsh, and Josh Weber, Core Principles on Reducing Recidivism and Improving Other Outcomes for Youth in the Justice System (New York: Council of State Governments Justice Center, 2014), https://perma.cc/Z67W-5LKC. Kids who receive services in their own homes and communities are able to maintain and even build connections to their families and other support systems, while also continuing to go to school, work, and other pro-social activities. James Austin, Kelly Dedel Johnson, and Ronald Weitzer, 2005, https://perma.cc/ZMV9-5EW6; and Edward P. Mulvey, 2011, https://perma.cc/WM59-QC4U. When status offense cases are sent to court, communities miss opportunities to get kids the right supports and, instead, expose kids to the justice system’s damaging effects. To start, when parents, schools, or other community members file status offense petitions against children, they signal to them that they are “bad”—a label that brings about stigma and negative self-esteem. Models for Change Juvenile Diversion Workgroup, Juvenile Diversion Guidebook, March 1, 2011, https://perma.cc/T69U-487N. And, the very experience of being in court increases the likelihood that kids will engage in future criminal activity. While research shows the effect of the court experience, there is no available research on the mechanisms by which court experience affects kids. See Uberto Gatti, Amelie Petitclerc, Richard E. Tremblay, and Frank Vitaro, 2013, https://perma.cc/XMQ5-UVZA. This trajectory is worsened when court involvement leads to sanctions such as detention and out-of-home placement—as it does for thousands of status offense cases each year. Sarah Hockenberry and Charles Puzzenchera, 2014, https://perma.cc/8XV4-G8F9. Locking kids up disrupts existing protective factors that could help kids do better—isolating them from their families and support networks and interrupting their education and other positive activities (such as jobs and after school programs). It can also expose them to a range of harmful experiences, including violence and abuse from peers and staff in facilities. Christopher T. Lowenkamp and Edward J. Latessa, 2004, https://perma.cc/37GT-JYXB; and Richard A. Mendel, Maltreatment of Youth in U.S. Juvenile Corrections Facilities: An Update (Baltimore: Annie E. Casey Foundation, 2015), https://perma.cc/9YKH-KT85. Kids who are locked up are more likely to drop out of school and become more deeply involved in the justice system. Barry Holman and Jason Ziedenbreg, The Dangers of Detention: The Impact of Incarcerating Youth in Detention and Other Secure Facilities (Washington, DC: Justice Policy Institute, 2011), https://perma.cc/LPW3-FKF3; and Edward P. Mulvey, 2011, https://perma.cc/WM59-QC4U. Beyond the human toll, this approach comes with substantial financial costs. Many jurisdictions continue to allocate significant portions of judges’ dockets to status offenses, misusing time and resources that could be spent on criminal cases. Confinement is both the most harmful and expensive intervention available—costing states upwards of $149,000 to incarcerate a kid for one year. Justice Policy Institute, Sticker Shock: Calculating the Full Price Tag for Youth Incarceration, December 2014, https://perma.cc/V452-YK9H; and Richard Mendel, No Place for Kids: The Case for Reducing Juvenile Incarceration (Baltimore: Annie E. Casey Foundation, 2011), 19-22, https://perma.cc/KBV7-6HYD. This cost doesn’t include the indirect, long-term price of confining kids—such as recidivism, lost future earnings, and additional Medicaid/Medicare spending—which is estimated to cost the country $8 to $21 billion each year. Ibid. Locking kids up isolates them from their support networks and exposes them to a range of harmful experiences—all at a great cost to communities. Given that many kids charged with status offenses would likely have aged out of their misbehavior on their own or with only minimal intervention, the high cost of using court-based responses makes little sense—particularly in light of high recidivism rates. Sharon Casey, 2011, https://perma.cc/L3YW-2SHZ; and Edward P. Mulvey, 2011, https://perma.cc/WM59-QC4U. These resources would be better spent on community-based prevention and diversion programs that cost less to begin with and result in substantial savings by improving youth outcomes. Elizabeth Seigle, Nastassia Walsh, and Josh Weber, 2014, https://perma.cc/Z67W-5LKC. The recommendations below focus on the creation of coordinated systems of care that keep kids in their communities and out of the justice system. Doing so requires a multi-pronged approach that trains system actors to more effectively respond to a kid’s behavior, repositions kids and families as partners in the service-planning process, and establishes a strong network of community-based supports that are tailored to the needs of those kids and families. Approach all misbehaviors with an understanding of youth development and needs. Whether it is a teacher reacting to an outburst in the classroom, an officer responding to an incident in the home, or a case manager determining a service plan, adults cannot properly respond to kids’ misbehaviors—either in the moment or procedurally—if they do not appreciate the context in which behaviors occur. Adults who work with or make decisions for kids must be trained to understand youth development and needs, as well as how those factors shape behaviors. This includes knowledge of the effect and signs of mental health problems and trauma, as well as an understanding of how culture, systemic bias, intersecting identities (including gender and gender expression, race, and sexual orientation), and their own personal biases influence dynamics with kids. Eliminate court as an option for status offense cases. Reforming how status offense cases are handled begins with keeping these cases out of court. Jurisdictions across the country have reduced and even stopped the inflow of misbehavior cases—through legislative changes, local policy reforms, or judicial orders. For example, courts across the country have reduced truancy caseloads by issuing stays on court petitions and/or requiring schools to prove that they have already made reasonable efforts to address the kid’s truancy. Rapides Parish, LA and Spokane County, WA offer two examples of jurisdictions that have successfully implemented such reforms. If courts no longer accept status offense cases or discourage petitions through diversion efforts, other systems—schools, child welfare, law enforcement, and social services—may be more encouraged to reexamine and improve their approach. It also allows resources to be reallocated from the justice system to preventive, community-based programs to support these changes. This is especially important for promoting the development of services for youth who have limited options in their communities. Understand kids and families as central to the solution. Kids are essential to identifying the underlying problems of their own misbehavior and developing an effective service plan that they believe in and are willing to be part of. Similarly, families (including biological, extended, and chosen family and anyone else who is an important support, as defined by the child) know their children best and are central to their children’s well-being—usually for the long-run. For more information on the importance of family as partners and on using broader definitions of family, see Ryan Shanahan and Margaret diZerega, Identifying, Engaging, and Empowering Families: A Charge for Juvenile Justice Agencies (New York: Vera Institute of Justice, 2016), https://perma.cc/TYE4-RT6T. Both parties should be key partners at each stage of the decision-making and service planning process—because they should have agency in shaping their own futures and because interventions are unlikely to be successful without their buy-in and influence. Develop a robust continuum of services that can meet the needs of youth and families in their communities. Not all cases call for interventions, and there is no one-size-fits-all solution for those that do. Support services are most effective when they are tailored to match the nature and intensity of kids’ needs. To achieve this, systems must be able to assess youth and family needs, triage cases appropriately, and have an array of service options that range from minimal (such as weekly mentoring check-ins) to more intensive and longer-term (such as in-home family therapy programs). It is also important that systems swiftly respond to the more serious and immediate needs of kids and families via readily available crisis intervention and mental health services. This holistic approach requires consistent cross-agency collaboration—both in how systems interact and share information, as well as how they serve individual kids and families. Measure and publicly report on the efficacy and fairness of status offense systems. As jurisdictions design and implement reformed, community-based status offense systems, it is critical that they examine the effects of current and new policies and practices, with an explicit focus on equity for girls, kids of color, and LGBT/GNC youth. By tracking and sharing their progress, systems are held accountable and can work towards achieving real change in how they serve kids and their families. Progress is happening. Connecticut’s successful status offense reforms demonstrate the value of shifting away from confinement and punishment and towards diversion and prevention. This work allowed state officials to turn their attention and limited resources to kids and young adults at the deeper end of the justice system in search of better solutions and healthier, safer communities. Against a national backdrop of declining juvenile crime rates and dramatic falls in the number of kids in facilities, the continued criminalization of status offenses seems like an artifact of another era. Punishing and confining kids for nonviolent misbehaviors that pose little to no public safety risk does nothing to address the underlying personal and family needs that social service systems have failed to treat, but it has potentially far-reaching, negative consequences on kids’ well-being. Furthermore, status offenses are at the very front end of the entire justice system—the earliest point of contact where young people have only misbehaved. If this point of contact is disproportionate—as it is for girls, poor kids, kids of color, and LGBT/GNC youth—then the discrepancy in incarceration and recidivism will ripple throughout the rest of the justice system and society at large. What is required is a strong commitment to better serve young people and their families, and to do so in their own homes and communities. Instead, what is required is a strong commitment to better serve young people and their families, and to do so in their own homes and communities. Systems must reframe these cases to focus on diversion and prevention, rather than potential detention, incarceration, or other legal and life-long consequences. This not only includes closing the proverbial “courthouse door” to these cases, but also training system actors to recognize the contexts and factors that drive a kid’s behavior and to effectively communicate and respond when these problematic behaviors arise. As this report has documented, this is not necessari­ly what happens today. The misuse of courts for status offense cases is not inevitable. Changing the nation’s approach will require a concerted effort from all the agencies that play a role in working with kids. By ensuring that every system actor is pushing these cases away from court and toward community-level responses at every turn, jurisdictions can stop the formal processing of status offenses, get families the supports they need, and help kids grow into healthy adulthood. Francine Sherman and Annie Balck, Gender Injustice: System-Level Juvenile Justice Reforms for Girls (Portland: National Crittenton Foundation, 2015), https://perma.cc/UVR9-RWWY. Uberto Gatti, Amelie Petitclerc, Richard E. Tremblay, and Frank Vitaro, “Effects of Juvenile Court Exposure on Crime in Young Adulthood,” The Journal of Child Psychology and Psychiatry 54, no. 3 (2013), 291-297, https://perma.cc/XMQ5-UVZA; and Edward P. Mulvey, Highlights From Pathways to Desistance: A Longitudinal Study of Serious Adolescent Offenders (Washington, DC: U.S. Department of Justice, Office of Juvenile Justice and Delinquency Prevention, March 2011), https://perma.cc/WM59-QC4U. American Psychological Association (APA), Developing: A Reference for Professionals (Washington, DC: APA, 2002), https://perma.cc/SX89-78PG. Institute of Medicine and National Research Council Committee on the Science of Adolescence, The Science of Adolescent Risk-Taking: Workshop Report (Washington, DC: The National Academies, 2011), https://www.ncbi.nlm.nih.gov/books/NBK53420/. TJ Berndt, “Developmental changes in conformity to peers and parents,” Developmental Psychology 15 (1979), 608–616. Sharon Casey, “Understanding Youth Offenders: Developmental Criminology,” The Open Criminology Journal 4 (2011) 13–22, https://perma.cc/L3YW-2SHZ. Laurence Steinberg, “Adolescent Development and Juvenile Justice,” Annual Review of Clinical Psychology 5 (October 18, 2008), https://perma.cc/X29S-CSFN. Malika Saada Saar, Rebecca Epstein, Lindsay Rosenthal, and Yasmin Vafa, The Sexual Abuse to Prison Pipeline: The Girls’ Story (Washington, DC: Georgetown Law Center on Poverty and Inequality, 2015), https://perma.cc/R26S-HE6P; National Conference of State Legislatures (NCSL), Homeless and Runaway Youth (Washington, DC: NCSL, 2016), https://perma.cc/DS44-VZ37. Wisconsin Department of Public Instruction (DPI), Answers to Frequently Asked Compulsory School Attendance Questions (Madison, WI: DPI, 2016), https://perma.cc/6GVV-EXR2. Sarah Hockenberry and Charles Puzzenchera, 2014, https://perma.cc/8XV4-G8F9. Texas Appleseed, Criminalization of Truancy in Texas: Prosecution of “Failure to Attend School” in Adult Criminal Courts (Austin: Texas Appleseed), https://perma.cc/8FGS-B2UV. Act4Justice, “What is the JJDPA?”, https://perma.cc/B852-KCR3. Kristin M. Finklea, Juvenile Justice: Legislative History and Current Legislative Issues (Washington, DC: Congressional Research Service, 2012), https://perma.cc/EF2W-FNSN. Act4Justice, “Fact Sheet: Deinstitutionalization of Status Offenses Core Protection,” https://perma.cc/A35S-FJ6N. Coalition for Juvenile Justice, SOS Project, “Fact Sheet: Use of Valid Court Order: State-by-State Comparisons,” https://perma.cc/5YYK-6NNB. Howard N. Snyder and Melissa Sickmund, Juvenile Offenders and Victims:1999 National Report (Pittsburgh: National Center for Juvenile Justice, 1999), https://perma.cc/WDR2-GY7J. Although it is not covered in this report, it is important to note that many parents today are sent to court for their child’s misbehavior. For example, recent media attention has been given to parents who receive significant fines and can be eventually jailed for their child’s truancy. This alternate punitive response has its own negative consequences for families and, like sending kids to court, does not address the problems that underlie the child’s misbehavior. See Jessica Feierman with Naomi Goldstein, Emily Haney-Caron, Jaymes Fairfax Columbo, Debtor’s Prison for Kids? The High Cost of Fines and Fees in the Juvenile Justice System (Philadelphia: Juvenile Law Center, 2016, 17-19), https://perma.cc/Z2RQ-8BUK. See also: Nadja Popovich, "Do US laws that punish parents for truancy keep their kids in school? ", The Guardian, June 23, 2014, https://perma.cc/7LG8-38E2; and Dana Goldstein, "Inexcusable absences," The Nation, March 6, 2015, https://newrepublic.com/article/121186/truance-laws-unfairly-attack-poor-children-and-parents. This concept has been noted by other experts in the field, including Francine Sherman and Annie Balck, 2015, https://perma.cc/UVR9-RWWY. Lindsay Rosenthal, “Ending the Unjust Treatment of Girls Charged with Status Offenses,” Think Justice (blog), Vera Institute of Justice, October 26, 2015, https://perma.cc/CT8F-UCLT; and Francine T. Sherman, 13 Pathways to Juvenile Detention Reform: Detention Reform and Girls: Challenges and Solutions (Baltimore: Annie E. Casey Foundation, 2005), https://perma.cc/R7K2-CPHT. Joan McCord, Cathy Spatz Widom, and Nancy A. Crowell, eds., “The Juvenile Justice System,” in Juvenile Crime, Juvenile Justice (Washington, DC: National Research Council and Institute of Medicine, Panel on Juvenile Crime: Prevention, Treatment, and Control, 2001) https://www.nap.edu/read/9747/chapter/7. Lindsay Rosenthal, 2015, https://perma.cc/CT8F-UCLT; and Francine Sherman, 2005, https://perma.cc/R7K2-CPHT. David M. Ramey, “The Social Structure of Criminalized and Medicalized School Discipline," Sociology of Education 88, 3, https://perma.cc/TNP5-97SG. American Psychological Association (APA), Black Boys Viewed as Older, Less Innocent Than Whites, Research Finds (Washington, DC: APA, 2014), https://perma.cc/9FAF-4MRH; Kimberlé Williams Crenshaw, Black Girls Matter: Pushed Out, Overpoliced and Underprotected (New York: African American Policy Forum and Center for Intersectionality and Social Policy Studies, 2015), https://perma.cc/G7VK-6R4F; and Monique Morris, Pushout: The Criminalization of Black Girls in Schools (New York: The New Press, 2016), 11. Angela Irvine, Shannan Wilber, and Aisha Canfield, Lesbian, Gay, Bisexual, Questioning, and/or Gender Nonconforming and Transgender Girls and Boys in the California Juvenile Justice System: A Practice Guide (Oakland: Impact Justice, 2017), https://perma.cc/3L9T-TMSB. James Austin, Kelly Dedel Johnson, and Ronald Weitzer, Juvenile Justice Bulletin: Alternatives to the Secure Detention and Confinement of Juvenile Offenders (Washington, DC: U.S. Department of Justice, Office of Juvenile Justice and Delinquency Prevention, September 2005), https://perma.cc/ZMV9-5EW6; Christopher T. Lowenkamp and Edward J. Latessa, “Understanding the Risk Principle: How and Why Correctional Interventions Can Harm Low-Risk Offenders,” Topics in Community Corrections (2004), https://perma.cc/37GT-JYXB; and Elizabeth Seigle, Nastassia Walsh, and Josh Weber, Core Principles on Reducing Recidivism and Improving Other Outcomes for Youth in the Justice System (New York: Council of State Governments Justice Center, 2014), https://perma.cc/Z67W-5LKC. James Austin, Kelly Dedel Johnson, and Ronald Weitzer, 2005, https://perma.cc/ZMV9-5EW6; and Edward P. Mulvey, 2011, https://perma.cc/WM59-QC4U. Models for Change Juvenile Diversion Workgroup, Juvenile Diversion Guidebook, March 1, 2011, https://perma.cc/T69U-487N. While research shows the effect of the court experience, there is no available research on the mechanisms by which court experience affects kids. See Uberto Gatti, Amelie Petitclerc, Richard E. Tremblay, and Frank Vitaro, 2013, https://perma.cc/XMQ5-UVZA. Christopher T. Lowenkamp and Edward J. Latessa, 2004, https://perma.cc/37GT-JYXB; and Richard A. Mendel, Maltreatment of Youth in U.S. Juvenile Corrections Facilities: An Update (Baltimore: Annie E. Casey Foundation, 2015), https://perma.cc/9YKH-KT85. Barry Holman and Jason Ziedenbreg, The Dangers of Detention: The Impact of Incarcerating Youth in Detention and Other Secure Facilities (Washington, DC: Justice Policy Institute, 2011), https://perma.cc/LPW3-FKF3; and Edward P. Mulvey, 2011, https://perma.cc/WM59-QC4U. Justice Policy Institute, Sticker Shock: Calculating the Full Price Tag for Youth Incarceration, December 2014, https://perma.cc/V452-YK9H; and Richard Mendel, No Place for Kids: The Case for Reducing Juvenile Incarceration (Baltimore: Annie E. Casey Foundation, 2011), 19-22, https://perma.cc/KBV7-6HYD. Sharon Casey, 2011, https://perma.cc/L3YW-2SHZ; and Edward P. Mulvey, 2011, https://perma.cc/WM59-QC4U. Elizabeth Seigle, Nastassia Walsh, and Josh Weber, 2014, https://perma.cc/Z67W-5LKC. Rapides Parish, LA and Spokane County, WA offer two examples of jurisdictions that have successfully implemented such reforms. For more information on the importance of family as partners and on using broader definitions of family, see Ryan Shanahan and Margaret diZerega, Identifying, Engaging, and Empowering Families: A Charge for Juvenile Justice Agencies (New York: Vera Institute of Justice, 2016), https://perma.cc/TYE4-RT6T. The authors wish to thank Erika Turner, Michael Mehler, Anna Hall, David Hanbury, Paragini Amin, and Jennifer Cox for their tireless effort and creativity in helping produce this report and video. We would also like to thank Dinae Anderson for sharing her story and advocating for youth, as well as Girl Be Heard for making this partnership possible. Thanks to Mary Crowley, Ram Subramanian, Krista Larson, and Karina Schroeder for their review and comments. We are also deeply grateful to the John D. and Catherine T. MacArthur Foundation for making this report possible and for supporting our status offense reform work over the past decade through their Models for Change and Resource Center Partnership initiatives.